IBM is the Dow’s biggest powerhouse and one of the most important companies for the U.S. stock market. The blue chip has shot up 300% in four years and is sitting just above important support. A breakdown here could have far reaching ripple effects. IBM is an “alpha stock.” Like an alpha dog or alpha male, alpha stocks lead the pack. What makes IBM an alpha stock? There is IBM’s storied history and $217 billion market cap, but what ultimately makes it a leader is the 11.28% weighting it carries in the Dow Jones Industrials Average and Dow Jones Industrials Average ETF, also called Dow Diamonds (DIA). IBM is also the fifth largest component of the S&P 500 SPDR (SPY). Unlike other indexes, the DJIA is price weighted, the pricier the stock, the heavier it’s weighted in the average. IBM trades at 190 and influences the Dow’s movements more than any other stock. Only two other companies are as influential (or more influential) as IBM: Apple and Exxon Mobil. We know that Apple’s 30% haircut put the entire U.S. stock market in a funk, so what’s IBM’s message? IBM lost about 10% over the past three months. This sounds like a lot, but when put in context with a long-term chart, it’s no more than a drop in the bucket. 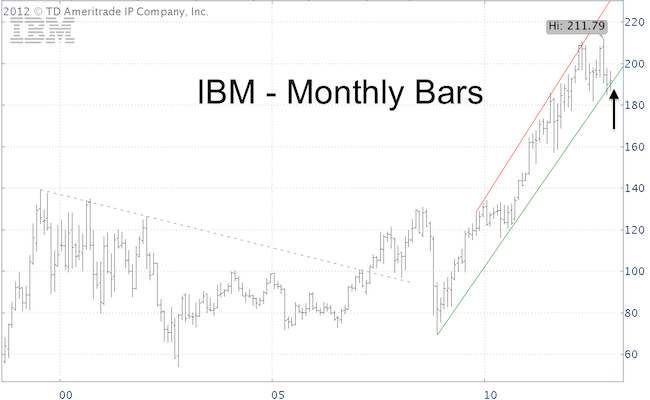 Since November 2008, IBM soared from 69.50 to 211.79, a 303% increase. The first quantitative easing (QE) intervention also commenced in November 2008, but surely any correlation between the two is purely coincidental. Regardless of the cause, the down side potential for a blue chip stock that’s tripled in four years is much greater than 10%. 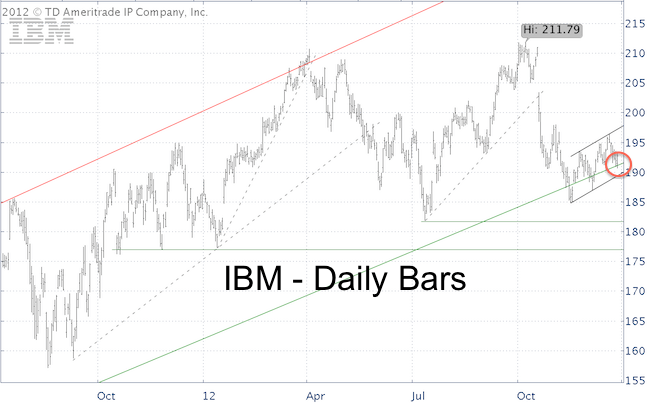 The short-term chart shows IBM toying with long-term (green trend line) and short-term support (black channel). A break below 190 would trigger a sell signal (stop-loss just above 192) with a possible short-term target of 177 – 182. To me, the structure of the decline since the October high suggests that prices ultimately want to head lower. Trade above 190 allows for limited near-term strength, but only a move above 198 (channel rising) would unlock more bullish potential. A drop below 190, on the other hand, could be the straw that breaks the camel’s back. Will Small Caps Lead the Market to All-time Highs? Market timers often watch small caps for clues about possible trend reversals, but thus far the Russell 2000 Small Cap Index is going strong. Here’s a closer look at seasonality and support/resistance levels for the Russell 2000. It’s said that major market tops are often preceded by weakness in small cap stocks. This premise makes sense, as small cap stocks are most sensitive to the ebb and flow of liquidity. As a liquidity gauge, small cap indexes like the Russell 2000 could be the canary in the mine. The truth is in the pudding. Does this theory hold up against the facts? 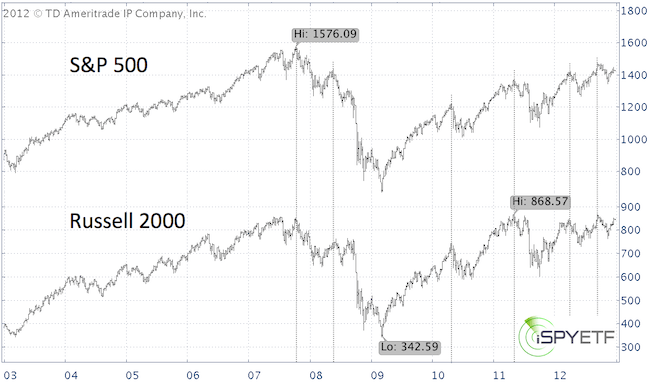 The chart below plots the S&P 500 Index against the Russell 2000. I guess the key point is how you define a “major” market top. Small cap weakness foreshadowed the 2007 top, but wasn’t obvious at the 2010, 2011, and 2012 highs (at least not on the weekly chart). What about today? Small caps are going strong and the canary is chirping and frolicking. The second chart provides a closer look at the Russell 2000 (corresponding ETF: iShares Russell 2000 ETF – IWM). 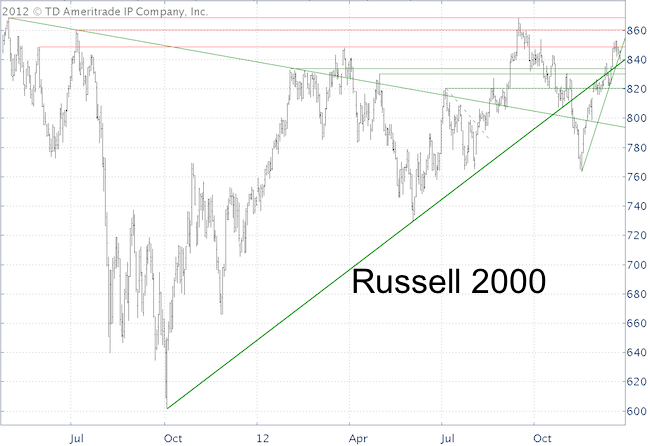 The Russell 2000 climbed back above the green trend line originating at the October 2011 low. Recent prior peaks supply various resistance levels (red lines) and today’s decline drove prices below the green November 15 support line (an early warning signal), but starting in mid-December small caps tend to outperform large caps. January is one of the strongest months for small cap stocks. Historical seasonal patterns suggest that more strength lies ahead for small caps. Technicals support this view. This may drive small caps to new all-time highs (less than 4% away), but I doubt it will be enough to push the Dow and S&P to all-time highs. A break below technical support at 836 (green trend line support) would warn that this year is different. Gold and Silver Plummet – Why and How Much Lower? It’s been a terrible week for gold and silver. Fundamentally precious metals should have rallied following the Fed’s announcement of QE4 (What is QE4?). Here’s the fundamental rationale. The Fed’s plan to spend an additional $45 billion of freshly printed money (QE Tally – How Much Money is the Fed REALLY Spending?) is supposed to create inflation. In theory, gold and silver are “default inflation hedges”. Investors trust this theory and put their money where their mouth is. How do we know this? Assets in the most popular gold ETFs – SPDR Gold Shares (GLD) and iShares Gold Trust (IAU) – soared to an all-time high. However, a theory (in this case the theory that QE will lead to higher gold and silver prices) remains only a theory until proven correct. What Caused the Gold/Silver Mini Meltdown? 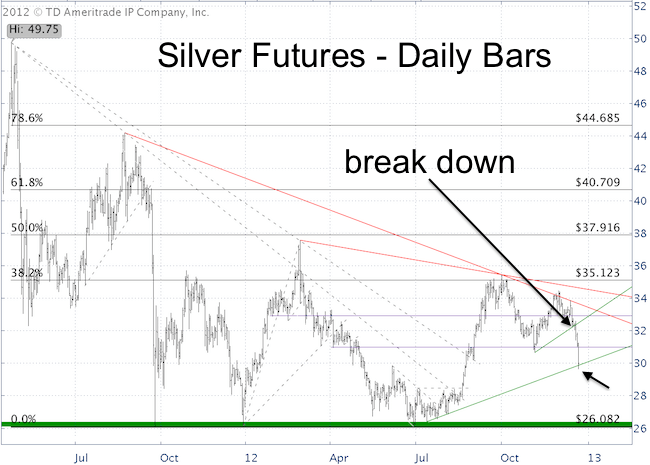 The corresponding trade setup for silver was as follows (updated chart shown below): “The dashed gray trend lines illustrate past instances where break downs and break outs resulted in low risk entry points. The green support line just below current prices (@32.30 – around 31.20 for SLV) may provide a low-risk entry to go short for aggressive traders. The only available short silver ETF is the 2x inverse UltraShort Silver ProShares (ZSL).” ZSL jumped from 45 to 52. I honestly don’t know how much farther gold and silver will fall. However, the two charts below show that both metals reached respective support levels. No one has ever gone broke taking profits and more often than not, it pays not to get too greedy. Gold provided a nice 50-point drop and silver declined more than 10% in less than 3 days (nearly 20% for ZSL). We locked in all of our silver profits and half of our gold profits. The remaining half of short gold positions is equipped with a stop-loss that guarantees profits. 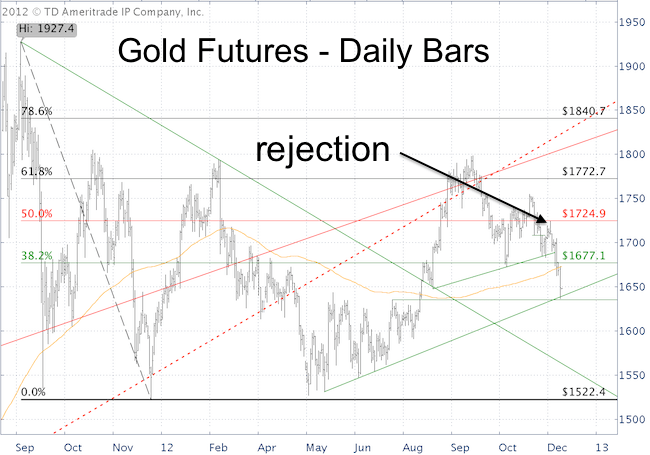 Semi-weekly updates and trade setups for gold, silver, the S&P 500, and other asset classes are provided via the Profit Radar Report. QE1, QE2, QE3, expiring Operation Twist, and now QE4. Which of those programs are “sterilized” (non-inflationary) and which ones devalue the dollar? If you’ve lost track, here’s a quick visual summary. Will Operation Twist be replaced by outright QE was a question addressed here early in December. As it turns out, the Fed decided to do just that. We now have multiple layers of QE working simultaneously. What’s the total amount being spent and will inflation finally take off? 1) QE3, announced on September 13, 2012. The Federal Reserve will buy $40 billion per month worth of mortgage-backed securities. 2) QE4, announced on December 12, 2012. The Federal Reserve will buy $45 billion per month worth of longer term Treasuries (corresponding ETF: iShares Barclays 20+ Treasury ETF – TLT). QE4 will be replacing Operation Twist in 2013. 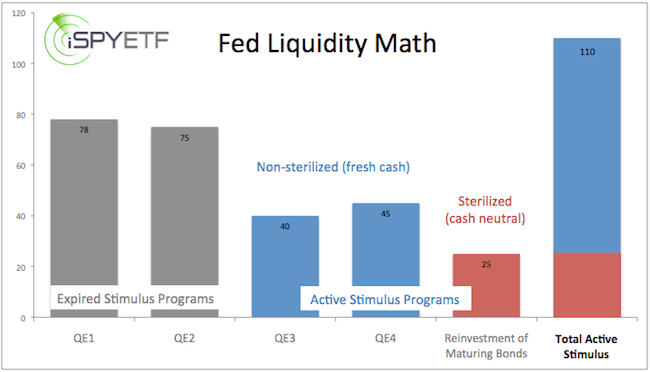 Operation Twist is considered “sterilized” or cash neutral QE. Operation Twist simply reshuffled the balanced sheet (sell shorter term in favor of longer term maturities). It did not expand the balance sheet. Unlike Operation Twist, QE4 will be financed by “non-sterilized” or freshly printed money. This process increases the Federal Reserve’s balance sheet and the amount of money in circulation. 3) Reinvestment of maturing securities. In a December 12 press release, the Federal Reserve stated: “The Committee is maintaining its existing policy of reinvesting principal payments from its holdings mortgage-backed securities and, in January, will resume rolling over maturing Treasury at auction.” This amounts to roughly $25 billion/month of sterilized QE. In total, the Federal Reserve will buy $110 billion worth of Treasuries and mortgage-backed securities every month until the unemployment rate drops below 6.5% and inflation remains below 2.5%. The first chart below illustrates QE3, QE4, and reinvestments separately and how the three layers combined compare with QE1 and QE2. The second chart provides a more detailed glimpse of the Fed’s balance sheet (and a mere glimpse is all mere mortals are allowed). 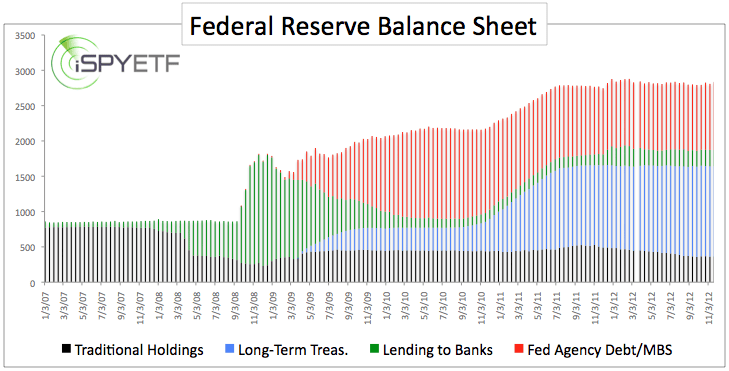 The Fed’s balance sheet as of November 21, 2012 stood at $2.84 trillion and is expected to balloon another $1 trillion over the next 12 months. Inflation, where art thou? The Fed’s balance sheet exploded from below $1 trillion to nearly $3 trillion, but inflation (let alone hyper inflation) has been a no show. Will the current round of QE deliver on inflationist’s predictions? I doubt it. Financials at 22-Month High – What Does this Mean for The S&P 500? Pssst, no one is talking about it, but one industry sector has quietly climbed to new 22-month highs – Financials. Will their run continue, how can you tell when it’s over and how will it affect the stock market? The financial media can’t see the forest for the trees or the stairs for the cliff. So much ink is being spilled reporting Obama’s and Boehner’s latest comments, hints and lunch menu, that the media missed the financial sector’s march to new 22-month highs. Will financials continue to edge higher, and what does the financial sector strength mean for the S&P 500 and other broad market indexes? The chart below provides a nutshell summary of the Financial Select Sector SPDR ETF (XLF). 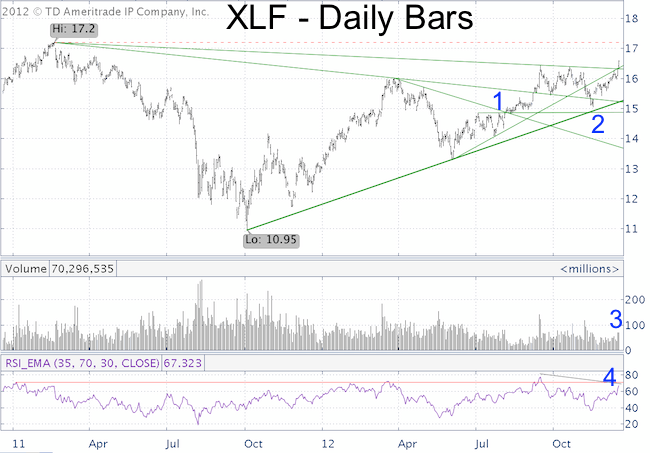 2) Shows that XLF never broke below the bold October 2011 trend line and never triggered a sell signal. The strength in financials was one reason the Profit Radar Report maintained that the down side of the post September correction was limited and exited all short positions at S&P 1,348 and S&P 1,371 (and went long at S&P 1,424 last week). 3) Volume over the last couple of days has been solid. 4) RSI is lagging the September 14 high water mark and will be running into resistance. RSI may also set up a longer-term bearish divergence if it isn’t able to beat the September high. XLF accounts for 15.42% of the broad SPDR S&P 500 ETF (SPY) and has the power to be the tail that wags the dog. This price/RSI divergence in XLF might harmonize with my expectation for a large-scale market top sometime in Q1/Q2 2013. There’s a newly formed support line (not shown in chart), which should be used as stop-loss for long positions. No doubt by the time the media moves the spotlight on financials’ performance, the lion’s share of the gains will be already over. Groupthink tends to create losses for most and juicy gains for a select few. The S&P 500 and gold show some compelling sentiment extremes that could be misleading if viewed in isolation. I love a good “reverse lemming” or contrarian trade. Investor sentiment is one of the best tools to spot a contrarian setup. Even though the market has been stuck in a rut, there are a number of sentiment extremes. Many of those sentiment extremes however, parade some curious anomalies. Last week Bloomberg reported that: “holdings in gold-backed exchange-traded products reached a record 2,629.3 metric tons yesterday,” an extreme sign of gold optimism. More people than ever flock into ETFs like the SPDR Gold Shares (GLD) and iShares Gold Trust (IAU). The fiscal cliff, QE3 and QE4 probably have something to do with that. Gold futures traders on the other hand are quite bearish. Only 10% of futures traders are bullish about gold. I have never seen such polar opposite sentiment for the same asset class. 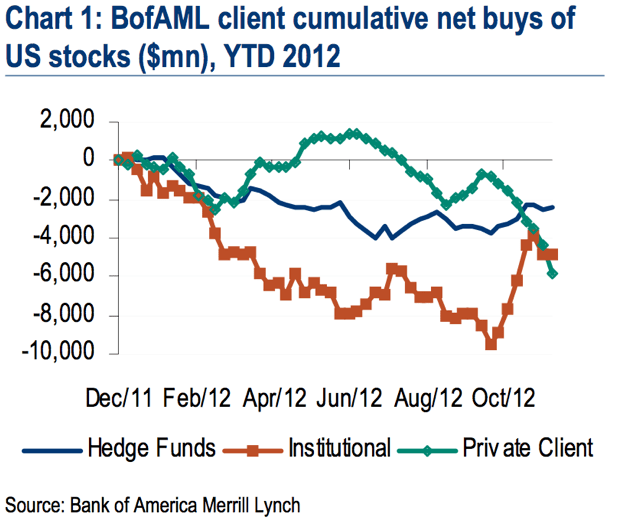 Bank of America just reported that its private clients (retail investors) are selling stocks at the fastest pace in 19 months (see chart below). Such eagerness to sell tends to occur around bottoms not tops. The behavior of option trades is the exact opposite of BofA retail investors. According to the ISE exchange, traders bought 208 calls for every 100 puts. Such a rush into call options has pretty consistently led to lower prices in the past. If you spend more time looking at other sentiment gauges, seasonality, technical patterns, cash flow, cycles of stocks vs. broad market indexes, and correlations between asset classes, you’ll find even more anomalies. The thing is, anomalies – curious and unique as they might be – cause analysis paralysis, they don’t provide trade setups. When in doubt, stay out or sign up for the Profit Radar Report to find low-risk trade setups. Low-risk setups provide sizeable profit potential in exchange for negligible risk, even in environments like this. P/E ratio analysis used to be a time-tested, go to valuation parameter. Recent changes however, have turned the P/E ratio into the most deceptive value barometer around. Here’s why. The P/E ratio is based on profits and only reliable as long as the “P” in P/E are actual profits. In a world where Wall Street thrives on manipulation, do P/E ratios still apply? To illustrate: Wells Fargo is trading around $33 a share with earnings per share of $3.18 and a P/E ratio of 10.40. This is cheap, isn’t it? But how do we know that Wells Fargo’s profit is really $3.18 a share? As of December 30, 2011, Wells Fargo had total assets of $1.313 trillion and total liabilities of $1.173 trillion. You and I don’t know what the assets and liabilities are, and I venture to say that Wells Fargo doesn’t even know. How much are the millions of homes Wells Fargo financed before the housing bust really worth? Again, we don’t know, but we know that due to an FASB (Financial Accounting Standard Board) rule change, Wells Fargo and every other corporation in the U.S. can now overstate the value of their under water assets. In 2008 the market turned disorderly and on April 9, 2009, the FASB (strong armed by Congress) changed rule 157 to suspend the fair value rules when the market is unsteady. Instead of reporting the current value of an asset (market-to-market), corporations are now allowed to pick a price they believe the asset will be worth in the future (mark-to-make-believe). Is that really what happened? 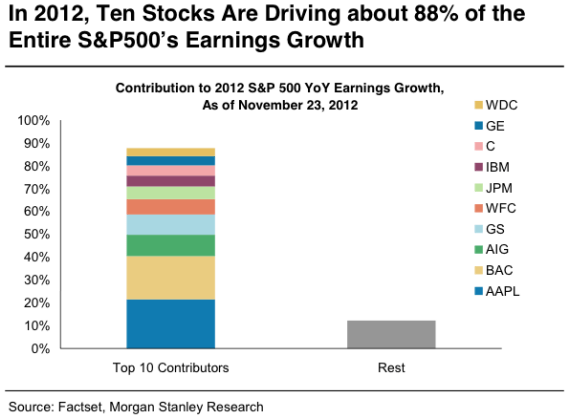 Let’s see which companies drove earnings growth for the S&P 500 in 2012. The chart and data below was compiled by Morgan Stanley’s Adam Parker. According to his research, ten stocks are driving about 88% of the entire S&P 500 earnings growth. Six (seven if you consider GE a financial stock) of the ten companies belong to the financial sector (Bank of America, AIG, Goldman Sachs, Wells Fargo, JPMorgan Chase, Citigroup). Without Apple and the financial sector, earnings growth for the S&P 500 would be next to zero. A bad year for Apple and a return to fair value accounting could easily double the P/E ratio. Based on P/E ratios, does the S&P 500 still look cheap?